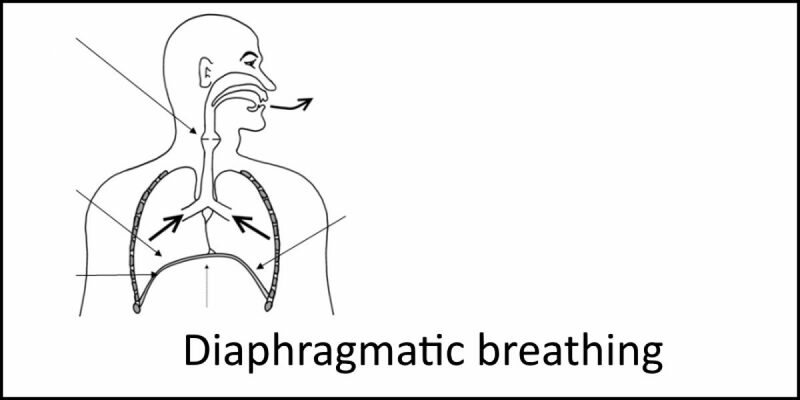 Why is diaphragmatic breathing important for my voice? Good breathing patterns are essential for producing a strong, effective and efficient voice. People with voice difficulties often use shallow, inefficient ways of breathing. Because of this, they can run out of breath when talking. Breathing should be relaxed and easy. There should be no straining. You shouldn’t feel out of breath when talking. Your breath support should be sufficient for your everyday needs. Also, you should be able to increase its capacity when more demands are made on your voice. A good breathing technique can help to increase the loudness of your voice without strain. One technique that helps with greater vocal demands and aids relaxation is diaphragmatic breathing. Either stand in front of a long mirror, with your feet about shoulder width apart, or sit on a straight-back chair without arms, placing your feet firmly on the floor. Place your hand on your tummy (midriff) just below your ribs. Get used to moving your tummy in and out by gently pushing your tummy out against your hand and then gently pulling it back in. Don’t worry about your breathing at this stage. Keeping your hand on your tummy, push your tummy out against your hand and take a small breath in through the mouth. Now gently and slowly pull your tummy in and let the air out gently through the mouth. Don’t force it. Make sure your shoulders don’t lift up. As you are gently pushing your tummy out, breathe in through the mouth. As you are gently and slowly pulling your tummy in, let the air out softly through the mouth. Repeat this a few times until you begin to feel as if you can coordinate all the movements smoothly and without straining. Gently yawn so that the whole of the back of the throat opens up and, at the same time, take a breath in – your tummy should also push outwards at the same time. Now gently pull your tummy in and let the air out softly. Again, repeat this a few times until the movements feel fluid and smooth. Remember not to force or strain during any of these exercises – be gentle and patient with yourself, these things take time to learn. Using the diaphragmatic breathing method outlined above, when letting the air out …. How long can you let the sound out for without pushing? Repeat this several times, without straining. Now try it using ‘shh’, ‘fff’ and ‘thh’ sounds. IMPORTANT NOTE: Be careful that you do not become light-headed or dizzy when practicing breathing exercises. If you do, this may be because you are either doing them too quickly or because you are forcing the breath. Stop for a few minutes and then try again gently. Try sitting down to practice the exercises. If the light-headedness or dizziness continues then stop doing the exercises and seek advice from your therapist.